(left to right) Jeremey Kaplan, Cortnee Doll, Melanie Simon and Liza Mitgang, all students who have returned from studying at the Ginsburg-Ingerman Overseas Student Program at Ben Gurion University of the Negev, attended the recent Philadelphia Chapter Tribute Brunch held by the American Associates of BGU of the Negev. Photo credit: Bonnie Squires. American Associates, Ben Gurion University of the Negev (AABGU), held its Philadelphia Chapter 40th Anniversary Tribute Brunch, honoring Charlotte and Dr. Carroll Weinberg, at the Ritz-Carlton Hotel on Sunday, November 11. More than 170 friends and supporters of AABGU came to celebrate the 40th anniversary of AABGU, including six American students who have spent either a semester or an entire year at the Ginsburg-Ingerman Overseas Student Program at BGU. Sam and Connie Katz, co-chairs of the Philadelphia Chapter of AABGU, presented the Tikkun Olam Award to Charolotte and Dr. Carroll Weinberg for their decades of supports for the university. The family of the late Harry Dozor, founder of AABGU, Dr. Rick Dozor, his mother Shirley Dozor and his son Harry Dozor, named for his late grandfather, received a special Dreidel sculpture award for their continuing support. Ambasssador Barukh Binah, Deputy Head of Mission at the Embassy of Israel in Washington, DC, delivered the keynote address. (left to right) Dr. Carroll Weinberg and his wife Charlotte were honored by Philadelphia chapter co-chairs Connie and Sam Katz with the Ben Gurion University Tikkun Olam Award at a Tribute Brunch in Philadelphia in the Weinbergs’ honor. Among the American Friends of Ben Gurion University gathered at the Tribute Brunch were (left to right) former PA State Senator Bob Rovner; Ambassador Barukh Binah, Deputy Head of Mission of the Embassy of Israel, who gave the keynote address; and Jack Bershad, AABGU Mid-Atlantic Region Chair. Arlene and Stanley Ginsburg, Dottie Wasserman and Ann Waldman. (seated) Murray Shusterman, Billy and Carole Stamps, and Aimee Katz. Honoree Charlotte Weinberg, her sister Rosalie Davison, and Marilyn and Bob Birnhak. Over the weekend, Deputy National Security Advisor Denis McDonough spoke in front of the Washington Institute for Near East Policy’s Weinberg Founders Conference. McDonough covered a wide range of topics regarding the Middle East, but spent a significant amount of time discussing the United States’ special relationship with Israel. Highlights of speech follow the jump. Current state of relations between Obama and Israel. Obama’s efforts to stop Iran’s pursuit of a nuclear weapon. All the while, the United States will be a stalwart friend and ally of Israel. I can assure you, that will never waver in our pursuit of peace. President Obama was determined to reverse this dangerous dynamic, to highlight the danger of Iran’s illicit program – one, incidentally, that it is pursuing at great cost to its own people – and to isolate Iran, rather than the United States. That determination is beginning to pay off. He has repeatedly stressed his determination to prevent Iran from obtaining nuclear weapons, and has consistently given Tehran a choice: Fulfill your international obligations, or face increasing pressure. To date, Iran has refused. And so, together with our partners, we have put in place the strongest sanctions that the Iranian government has ever faced. As a result, Iran finds itself isolated from the international community; finds it harder than ever to acquire materials for its nuclear and weapons program; and to conduct transactions in dollars and Euros. It’s struggled to buy refined petroleum and the goods it needs to maintain and modernize its oil and gas sector; it’s unable to access over half its foreign currency reserves; and its currency has lost over half its value since this time last year. Throughout that country, Iranians are turning to gold to secure their assets, and the Iranian government has introduced strict controls on the sales and purchase of foreign currencies. This is the pain and misery that the regime itself has imposed on the Iranian people. Leading global companies have stopped doing business there, and more recently, we, working with Congress and our international partners, have increased pressure on Iran by targeting its central bank and its oil exports – the main source of its revenue. The results have been significant – in fact, far greater than we would have anticipated, with countries throughout the world acting to reduce their purchase of Iranian oil and to reduce their exposure to Iran’s financial system. I should note that 11 countries so far have significantly reduced their imports of Iranian oil. Others have indicated their intent to do so, including countries as diverse as South Korea and Turkey, and we expect still others to indicate a similar intent in the coming days and weeks. 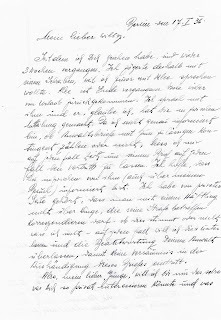 The archivist at Brandenburg found, among the legal documents, a personal letter to my father from a friend of his, Oskar Gellman, dated January 17, 1936, with an extra note by Erna, whom I assume to be his wife. His friend not only decided to appraise him of the mundane events of his acquaintances during the time her was in prison, but also to entertain him and keep his spirit up. Why the wardens would have kept just this letter, I have no clue, but the writer is so very vivid and ascerbic in his wit, that perhaps they kept it as an example of how funny these Jews could be. His writing verges on the Rabelaisian and he pokes sharply at his friends and acquaintances.